During the gait, alternating flexion and extension of the lower limbs would impart alternating twisting forces on the pelvis around its lowest transverse axis. This effect can be shown in a pretzel-model. When we hold a pretzel in two hands and twist it around its long axis in alternating directions, the pretzel will snap eventually. This is what happens clinically with the sacrum during insufficiency fractures. As previously mentioned, this happens most frequently with elderly women, whose sacroiliac joint is relatively ankylosed and whose sacrum has been weakend by osteoporosis. Under these conditions, the torsional stress which is normally buffered by the sacroiliac joint, will be transferred to the sacrum. Because of the conditions of the weakend sacrum, it fails to buffer the torsional stress and fractures occur. In most cases, these fractures run vertically through the ala of the sacrum parallel to the sacroiliac joint. The sacrum is a triangular bone formed by 5 vertebral segments. It is broader on the superior side than on the inferior, and broader on the anterior side than on the posterior side, allowing the sacrum to resist shearing from vertical compression as well as transfer loads from the spinal column to the pelvis. The sacrum articulates superiorly with the fifth lumbar vertebra and inferiorly with the coccyx. The lateral surface of the upper part of the lateral masses (auricular surface) articulates with the ilium. 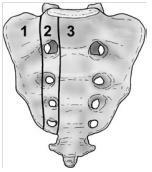 Denis et al classified traumatic sacral fractures by dividing the sacrum into 3 zones (Fig.1).This classification system is based on the direction, the localisation and the level of the fracture. These traumatic fractures are not directly related to SIFs, but the classification system of Denis is very useful for the description of these SIFs. Zone 1: involves the sacral ala (lateral to the sacral foramina). This is the most common area of SIFs. Zone 2: involves the sacral (neural) foramina (but the fracture does not enter the central sacral canal). The fractures in this site are associated with unilateral lumbosacral radiculopathies. Zone 3: involves the sacral bodies and the transverse central canal. Patients with SIFs usually present reporting vague, non-specific signs and symptoms. Patients will commonly describe problems with walking, pain and tenderness on palpation over lower back, hip, groin and/or diffusely over sacral region, leg weakness and parasymphyseal tenderness . Aggravating factors include weight bearing activities, especially walking and pain is eased by rest, usually in the supine position. There is no typical 24-hour picture as it is activity dependant. A neurological examination is often normal. The frequency of undetected sacral fractures is high. SIFs could be considered as a differential diagnosis for osteodegenerative diseases, radiculopathy, spinal stenosis & cauda equina syndrome, particularly if the pathology progression is atypical and/or not responding to treatment. Generally sacral insufficiency fractures are treated conservatively with relative rest, analgesia and physical therapy. Early ambulation may reduce the complications and significant morbidity and mortality associated with prolonged immobility. Percutaneous sacroplasty is a variation of percutaneous vertebroplasty. It is an alternative that may provide symptomatic relief and accelerate the recovery. Sacroplasty involves the precutaneous insertion of 1 or more bone needles into the fracture zone of the sacral ala. PMMA (polymethylmethacrylate) cement is then injected in this zone with the aim to treat the lesion and to stabilize the sacrum. Carina L. Et al. discribed that CT guidance can improve this procedure. Sacroplasty provides symptom relief including pain relief and functional restoration. The quality of life of the patients is improved and the complications of immobility are avoided. However the longterm results of sacroplasty are not known yet. Further research into the effectiveness of sacroplasty is required. Early rehabilitation and moderate weight-bearing exercises within the boundaries of pain tolerance are recommended. Earlier rehabilitation will stimulate osteoblastic activity and help maintain muscle mass and strength. In the early stages of fracture healing, mobilisation can be assisted by the use of support devices such as crutches or walking frames or hydrotherapy which is typically better tolerated by many patients. Extracorporal shock wave therapy can also be used. Like the PEMF and the LIPU techniques it stimulates growth factors where the body shock is applied. ↑ Lyders E.M., Whitlow C.T., Baker M.D., Morris P.P., Imaging and treatment of sacral insufficiency fractures (review), Am. J. Neuroradiology 31:201-10, February 2010. ↑ Wild A., Jaeger M., Haak H., Mehdian S.H., Sacral insufficiency fracture, an unsuspected cause of low-back pain in elderly women. Arch. Orthop. Trauma. Surg (2002) 122:58-60. ↑ Bong-Jin H., Kim J.T., Chung D.S., Sacral insufficiency fracture, most overlooked cause of lumbosacral pain. J. Kor. Neurosurg. Soc. September 2008, 44 (3): 166-169. ↑ 6.0 6.1 Tsiridis E., Upadhyay N., Giannoudis P.V., Sacral insufficiency fractures: current concepts of management. Osteoporos. Int. (2006) 17: 1716-1725. ↑ Dasgupta B., Shah N., Brown H., Gordon T.E., Tanqueray A.B., Mellor J.A., Sacral insufficiency fractures: an unsuspected cause of low back pain. British Journal of Rheumatology 1998; 37: 789-793. ↑ Hatgis J, Granville M, Jacobson RE, Berti A. Sacral Insufficiency Fractures: Recognition and Treatment in Patients with Concurrent Lumbar Vertebral Compression Fractures. Muacevic A, Adler JR, eds. Cureus. 2017;9(2):e1008. doi:10.7759/cureus.1008.